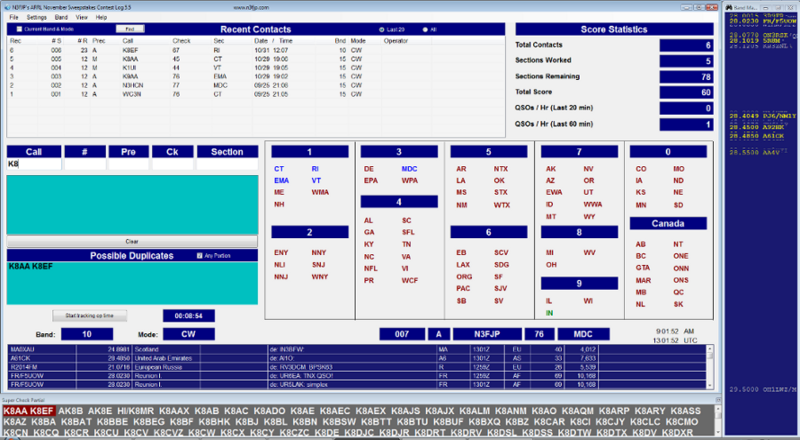 November Sweepstakes Contest Log 5.5 Now Available with Super Check Partial! November Sweepstakes Contest Log 5.5 is Now Available! If you'd like to try the new Super Check Partial feature, from 5.5's menu options click Settings > Super Check Partial and check the check box to enable the feature. You can either display the data in the Possible Duplicates control, or on a separate, floating form that you can drag and resize wherever you like! I am planning to add Super Check Partial to the rest of my software, but that will be a big job, so I'd really like to receive your feedback on this implementation first. Please give it a try and let me know how it works out for you! For those of you who always write and encourage me to keep my software easy to use as new features are added, don't worry, my software looks, displays and functions exactly as it always has by default. You don't have to enable Super Check Partial if you don't want to. Enjoy November Sweepstakes, the good band conditions and good luck on getting the clean sweep! - From the menu options of the November Sweepstakes software, click Settings > Appearance > Form Size and enter 90. - Close and restart the November Sweepstakes software. - Mouse over the band map, click the Vertical / Horizontal button so that it is vertical and then move the Band Map to the top, far right. - Click Settings > Super Check Partial, enable the feature and select the floating form option. - When the Super Check Partial form displays, drag the form and edges to resize it to fit the bottom of your screen. Red on the Super Check Partial window indicates possible duplicates. As more characters are typed in the Call field, the SCP list becomes more manageable. In addition, with a form size less than 100, you can now drag the edges of the main form and the controls will reposition accordingly, This approach will not affect the font size, so choose a form size close to what you want to begin with. If you need to start over for any reason, enter a value of 100 for the form size to clear your manually changed height and width. Again, for those of you who find this display too busy, want to keep things simple and just want to see the main form, that's fine! The single, main form will display by default, just as it always has. The rest is optional for you to enjoy if you ever decide you want to!